My new cookbook is available for pre-order now on Amazon, and is voted Amazon Editor’s pick as one of the Best Books of the Month. 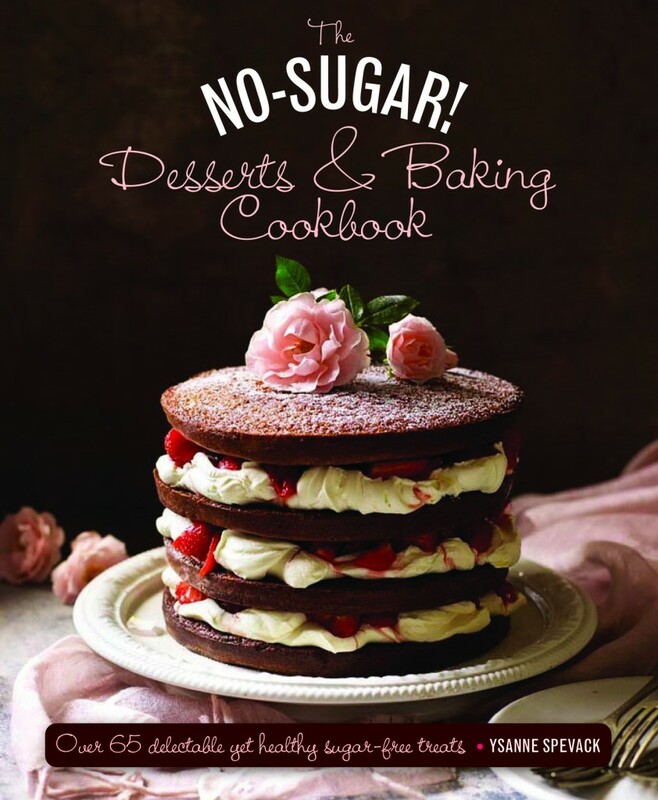 Cutting refined sugar from your diet doesn’t have to be hard, as this super-healthy collection of delicious cakes, pies, tarts, crisps, cookies, ice creams, cheesecakes and sweets shows. My new cookbook shows you how to remove refined sugar where it really matters, in sweet puddings and cakes! These irresistible yet healthy desserts use nutritious ingredients. All are no-sugar, and many are also gluten-free, raw, dairy-free, vegan and paleo too. 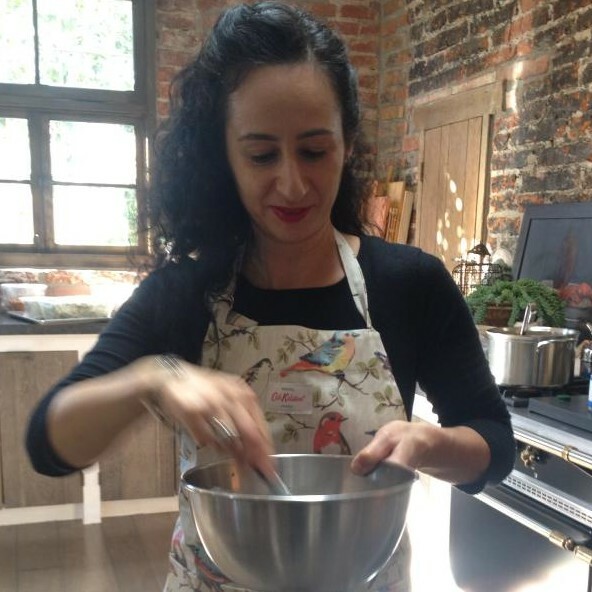 My tried and tested recipes don’t simply replace sugar with chemical substitutes, but use natural and unprocessed sweeteners, alongside tips and techniques. I’ve included a detailed and descriptive guide to sugar substitutes, including which ones are good, and which aren’t… and why, so you can make informed decisions about which natural sweeteners are best for your family, and which ones work in different recipes. Satisfy your sweet craving with custard puddings, fruit pies, chilled parfaits, creamy cheesecakes and chocolate candies made with raw cacao and other healthful ingredients, with delicious ideas for family weeknight meals and dinner parties. Each and every *kindelish* will feature a 5-course organic, sugar-free, gluten-free supper of local produce, with a little exotic extra stuff thrown in. And live music, plus real art, plus a speaker to get the conversation going with our cool, creative guests. 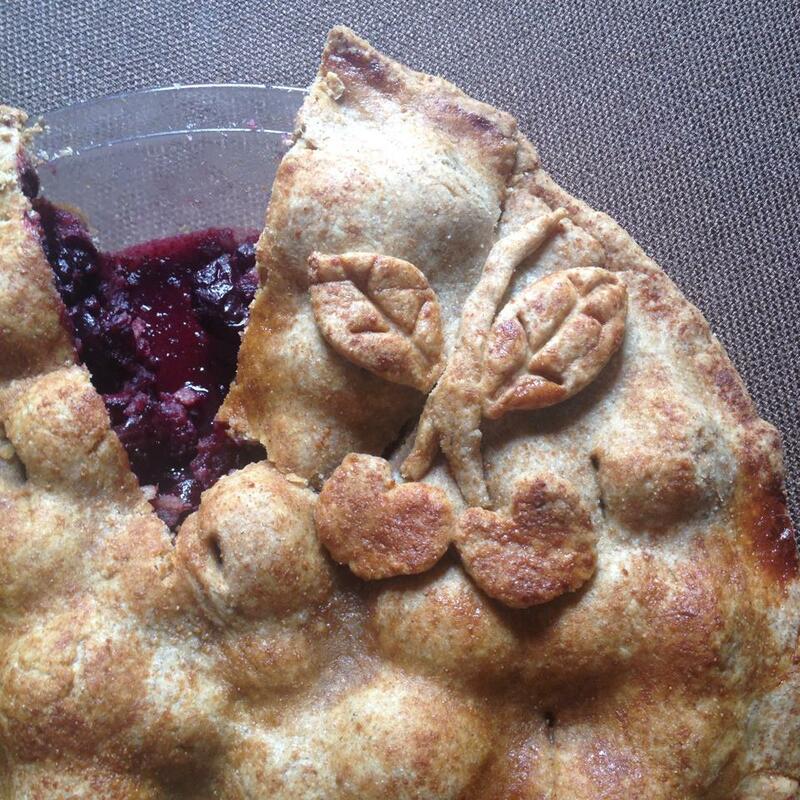 July 4th is prime pie time, and this summer’s fruit has to be the dark red cherry. Rainer cherries are sweet and delicious, but the darker the red, the more sensual the pie. So here’s my cherry pitting tip. Take a frosting tip, the kind of tiny metal cone that’s used to frost cupcakes, and sit it on a non-porous cutting board. Not a wooden board, because it will stain forever, but a glass, marble or plastic board. Remove the stems from the cherries, and wash them. Then place each one, stem side down, above the point, and push down. Out comes the pit, very easily for the very ripe ones, but still pretty quickly for the firmer ones. It’ll take about 10 minutes to pit a whole pound of cherries, which is the perfect amount of fruit to bake a classic 9″ pie. 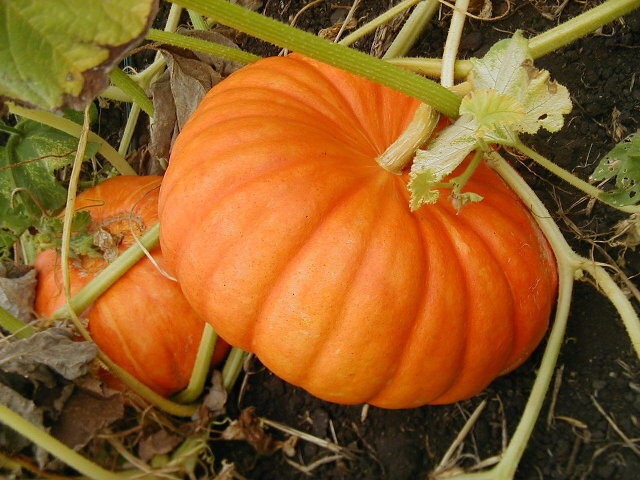 Things to know about growing pumpkins. 1. Always plant them in a group of three. They are one of the plants that grow best in a group, which is called ‘a mound’. It’s not a mound of earth, not a little hill, but it’s the name for a little group of a few pumpkin plants. 2. They love growing with beans, so if you can, plant a pumpkin (at this point, get a little guy already started in a pot, not from seed, to make sure you have enough time to get ripe pumpkins)… and then plant a few bean seeds nearby. 3. They are VERY hungry, so make sure you give them plenty of organic fertilizer. Just buy a bag of Dr Earth brand organic vegetables fertilizer, or similar. And as with everything, water at night, about 2 hours before sunset is ideal, but it can be any time in the evening also if you’re out. Better than watering in the day. As for the slimy ones, like slugs and snails, spray is pointless. The best way to deal with them is simply to pick them off by hand, one by one, and either destroy them (squishing underfoot etc) or throwing them far, far away into a park etc. There are various other methods (beer trap in the ground, copper tape around the plants), but all of them are crap compared with simply removing them by hand. Other than that, pumpkins are pretty easy. It’s too late to sow seeds and have guaranteed ripe pumpkins in time for Hallowe’en, but pick up some organic baby plants from the nursery, and you’re good to go. Wild food is the most seasonal of all, strictly governed by micro-climatic changes and local conditions, be they soil-related or caused by man or beast. 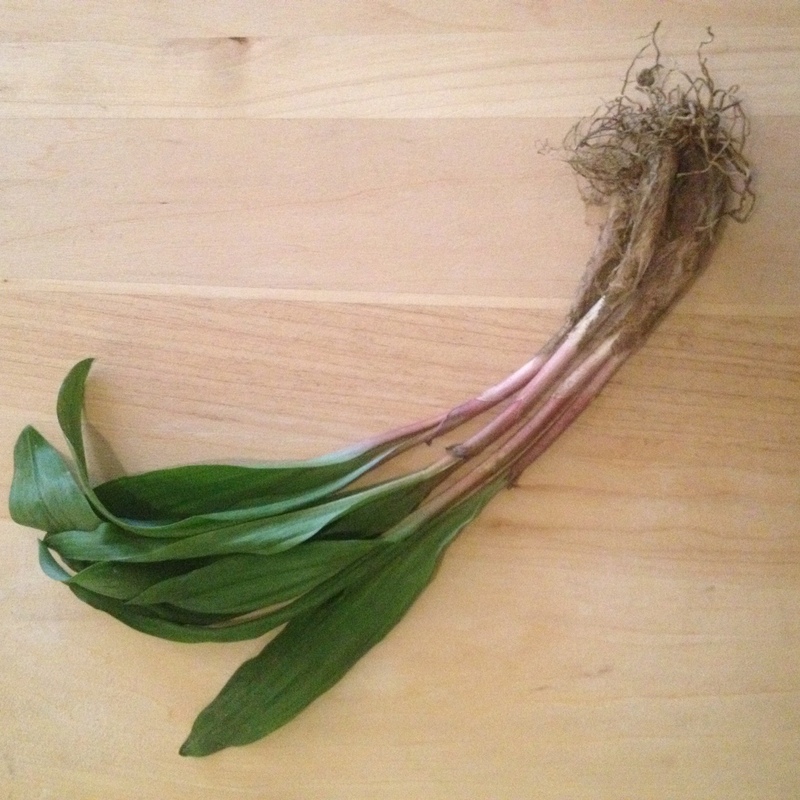 That’s why ramps have such a strong on our collective culinary imagination this month, with everything from ramps pesto to ramps ice-cream tempting us from restaurants, magazines and friendly kitchens in your own neighborhood. They’re simple to enjoy. Whether they taste like strong green onions or mild garlic chives depends on your perspective, but either way, use them sparingly, and unless you’re extremely allium oriented, they’re best eaten cooked, whether sauteed or blanched. For pesto, blanch the in boiling water for about one minute, then grind with fresh herbs; try nettles instead of basil, as it’s also wild nettle season. And while you’re there, consider replacing traditional pesto pine nuts with walnuts, or with black walnuts if you’re able to source them. For ice cream, simply make your ice cream recipe as usual, but omit the sweetener. Extra salt and pepper, and finely minced and sauteed ramps will produce a wonderfully savory ice cream to enjoy on its own, or as a meltingly delicious semi-solid side ‘sauce’ with a hot entree, for example, roast chicken. If you’re pretty much anywhere in the Northern Hemisphere, it’s challenging for you to imagine Spring right now. Snow has laid her blanket of silence over a frozen soil, and January’s darkness seems relentless, the days imperceptibly longer. 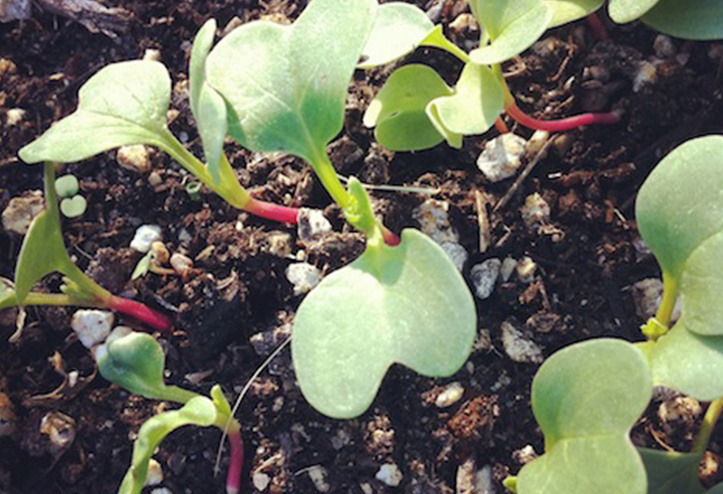 But as sure as the sun makes daylight, the days are getting longer, and one day a few months from now, you’re going to be delighted you had the foresight to buy summer seeds right now, ready to plant your spring garden. Start slow-growing summer vegetables in your kitchen as soon as the end of January, even in the coldest parts of the US. That’s eggplants, celery, peppers and tomatoes. Choose something exciting to grow, unusual varieties with the greatest flavors and the highest nutrient profiles. Go for the tiniest, darkest cherry tomatoes, because they’re the sweetest, and have the most complex flavors, as well as the highest amounts of phytonutrients. Or go big and luscious for slicing in a summer salad. A variety called Pineapple never fails to please, and well, there are just so many amazing tomatoes to choose from. Something ideal for every climate zone. Choose luscious eggplant varieties like Syrian or Japanese varieties, or eggplants bred to suit your local climate, like the New York Compact Eggplant, which produces perfectly in New York’s climate, and gives the maximum amount of fruit per plant. Alternatively try a variety called Little Sailor, simply because it’s stripey and adorably cute! Celery is celery, right? Well not any more, now even celery is available in a myriad of exciting varieties, including my new personal favorite, Redventure, which has all of the nutrients of regular white celery, plus the anti-inflammatory nutrients that come in the package with anything red, from blueberries to red wine. And then there are peppers. It’s time to order your chile peppers, sweet peppers, pasillas, anchos, and pretty much every kind of pepper you can think of! I plan to start getting mine potted the weekend of January 25th and 26th. Personally, I love using a method called soil blocking, which is akin to making mud pies. There’s no pot, just a firm enough soil mixture that I can form it into blocks, but still soft enough for the tiny seedling roots to effortlessly penetrate it. But really, it’s probably best to get them started in any pots you may have to hand for now, and then consider repotting the seedlings into bigger and bigger pots over the coming weeks until the ground is warm enough to plant them in the ground. It’s December. 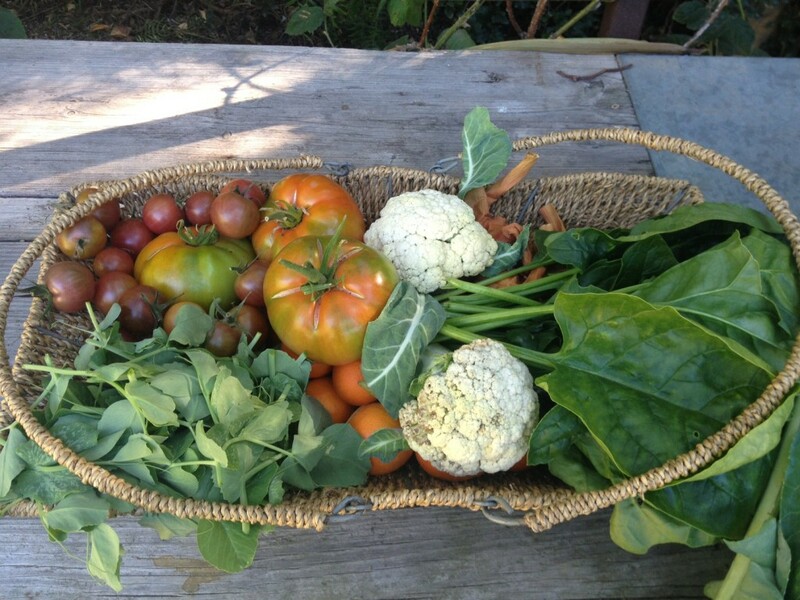 But, this is Malibu… so yesterday I harvested this luscious basket of fresh goodness from the garden. As you can see, the basket contains varieties only found in summer gardens in other places, as well as more traditional winter produce. We are incredibly lucky to be able to eat this fresh bounty year-round here in Southern California. Also apples, mineolas, and always a lot of herbs. A lot of cleaning and pruning, also some weeding and hand-watering, and a little planting. Also some singing, dreaming, pondering, and problem-busting, which are the other things that happen when you’re gardening, which are perhaps almost as central as growing the produce. So while I sang, I cleaned the tomato, cauliflower, lettuce and kale beds. I removed yellow leaves, rotting fruit, weeds, and bugs. I squished snails and composted rotten tomatoes. I pulled weeds, including nasturtiums, which have pretty edible flowers, but are also basically fancy weeds. And I hand watered a lot of stuff not on the list yet, because it’s still growing, including a lot of Napa cabbages. Anything I hand-water, I water with water from the fish pond, because it’s rich in fish poop! With all the cleaning and clearing done, I got to plant 3 heads of garlic, which will become about 60 new garlic bulbs by the time they’re ready to be pulled, at the end of March. And I planted about 70 red onion sets around the garden, so we have red onions to eat, and also so the other crops are protected from aphids and other critters… none of the beasties like onions, except us. Next week I’ll plant more lettuces, and yellow onions, and I’ll also hand-water the acid-loving crops with water laced with vinegar… that’s the blueberries, strawberries and asparagus. And I’ll add a little seaweed to the Romanesco cauliflowers to give them a little swirl to their curl. This week I was busy. Quick trip to London, then whizzed back to Malibu for a photo shoot. Not me, my food! Lots of fun playing with fresh ingredients from the garden, particularly the cauliflowers which are sweet and enormous right now. And somehow, I suddenly was inspired to create a new cupcake recipe. Gluten free. Sugar free. Yummy. No flour. Lots of pumpkin seeds. And blueberries, a ton of fresh and dried blueberries, all squishy after being baked. 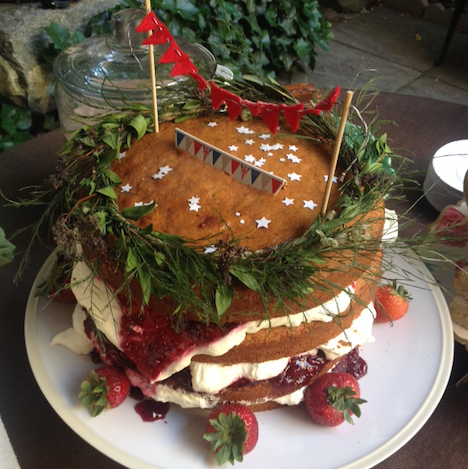 Recipe coming your way in my new cookbook, due out sometime in 2014… subscribe to my newsletter so you know when it’s ready and available, you won’t want to miss it, Mmmmmmm!!! I’ve always loved the color purple… the book, the film, and the actual color! 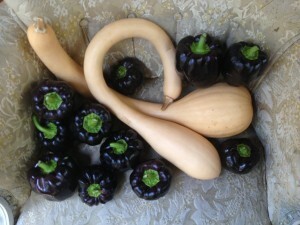 It’s the color of eggplants, so beautiful, but what else can be grown and eaten that’s purple? I love the purple beans I grew this summer, a variety called Royalty Purple Pod Bush Bean. Similar to a regular green bean, they’re eaten whole, pod and all, but are a gorgeous shade of purple on the outside, and a dark green on the inside, about the same shade as a regular French bean. Tonight I’m serving Purple Majesty potatoes, boiled and then mashed with butter, sea salt and garlic. They’re much healthier than white potatoes, because they have a lower glyceamic index, and simply because of their color. Anything purple in the vegetable kingdom contains anthocyanins, a group of phytonutrients known to protect humans against cancer and all of the other diseases caused by chronic inflammation of the cells. It makes blueberries blue, it makes blackberries black, and it makes scientists recommend you enjoy a glass of red wine now and then. Also there are some beautiful purple cauliflowers in your local autumnal farmer’s market. My favorite variety is called ‘Di Sicilia Violetto’, and it’s not difficult to grow from seed. It’s a very bright shade of purple, with vibrant green leaves around the crown. Kale is naturally purple too, and so is purple sprouting broccoli. In fact, LOTS of vegetables are purple, and rightly so… the darker the shade, the better they are for you, and also in my opinion, the better their flavor, and the more enticing they are. So as well as asking your children to eat their greens, why not eat try giving them purples? They’re so fun and exciting, I have no problem getting kids to eat purple veggies. Oh, and Kristine is gluten-free and allergic to garlic, so that rules out my home-baked breads, and pretty much anything Italian. And she’s the author of a number of very wonderful cookbooks, so I can’t just serve something unimaginative, even if it’s delicious. Luckily, the garden is going crazy this month, with tons of curly-whirly trombetta squash and buckets of Black Beauty bell peppers, so called because they’re black. So my main ingredients are intrinsically simple and seasonal, and also have a nice little twist. The trombetta squash are closely related to butternut squash but are less sweet, and the black bell peppers are very similar to green bell peppers, but also less sweet. So I’m going to throw them into the oven with a gorgeous olive oil I recently discovered, and with plenty of fresh thyme, so delicious with fall squash, particularly hard squash like butternut, spaghetti, and trombetta. I’ll cook them low and slow, the squash in an open pan, and the peppers in my cast iron Dutch oven. I’ll cook my homegrown veggies sprinkled with French grey salt and crushed peppercorns, and I’ll caramelize a few lemons too, skins and all. Then I’ll whizz them into a satisfying autumnal soup with a little ground coriander and cumin seeds, and serve it with a wedge of fresh lemon to the side of each bowl. I may also make a tapenade out of the beautiful black bell peppers, mincing them with raw black olives and tasty olive oil from the baking pan, and then serve with crudites as an alternative to soup and salad. Here’s my recipe for Caramelized Lemon, Squash and Bell Pepper Soup. The quantities given are rough guides, please feel free to vary them to suit your own autumn harvest and varieties in your own garden or farmer’s market. Heat the oven to 350ºF. Drizzle the olive oil into the bottom of a large open pan and a cast iron Dutch oven. Add the bell peppers to the Dutch oven, and the squash and lemons to the open pan. Drizzle everything again with a little more oil to coat. Sprinkle generously with fresh thyme leaves, salt and pepper. Bake for about 40 mins to 1 hour or longer, until the vegetables and lemons are all very soft and caramelized. Meanwhile, heat 14 cups of water in a large stock pot with the leek, carrots and celery, plus a tablespoon of salt and a tablespoon of pepper. Bring to a rolling boil, then reduce to a slow simmer and cook for an hour. Remove the stock vegetables and discard, and retain the stock water. When the roasted vegetables are ready, combine them in batches with a little stock, including the whole lemons, and pulse in a blender or high-powered blender. Set aside. Over a medium heat, melt the coconut oil in a small frying pan, then add the cumin and coriander when no solid coconut oil remains. Stir with a wooden spoon for one minute, until the spices have released their aromas, but being careful not to burn them. Pour the spice mixture into the soup, and stir to combine. Ladle into bowls and serve with a twist of fresh lemon. #Top Tip: If possible, leave the soup to develop over 24 hours before serving. The flavors continue to mingle and combine if you make the soup the day before it’s due to be eaten.